Discussion in 'Utah Jazz' started by Stoked, Sep 28, 2018.
maybe you'd also consider quitting Jazzfanz?? Na. I'm too beloved here for that. I just want a competitive series that goes beyond five games. I don't think the Jazz will win this series, though if they do I'll be really ****ing happy, but I am tired of getting our asses handed to us in series we get bounced from the playoffs. I know that sounds like a trivial thing to get upset over but the last semi-competitive series the Jazz actually lost was in 2008 against the Lakers - over a decade ago. I really want a tough, bloody series even if the Jazz are unable to advance. Really, that's what I am looking for here. It's a bad draw but if this team is making the progress some suggest, it's a series that should be way more competitive than the **** show we saw last year. Even if the Jazz get bounced, if they can stay competitive and win at least a couple games, I'll feel the franchise is heading in a pretty favorable direction. If they go out and get swept, or lose 4-1, I'll be less inclined to buy the preseason hype come fall. We didn’t have our starting point guard each of the last two years. That killed us. Speaking of point guards, are we to assume that Dante is available for the playoffs or is he officially done? Wasn't sure how extensive his surgery recovery timeline would be and if it would be a possibility to play. DasJazz and fishonjazz like this. I think you mean ded. Sandman822, Moonlight Graham, LogGrad98 and 4 others like this. Was trying to post a pic of my Sailor Jerry’s. 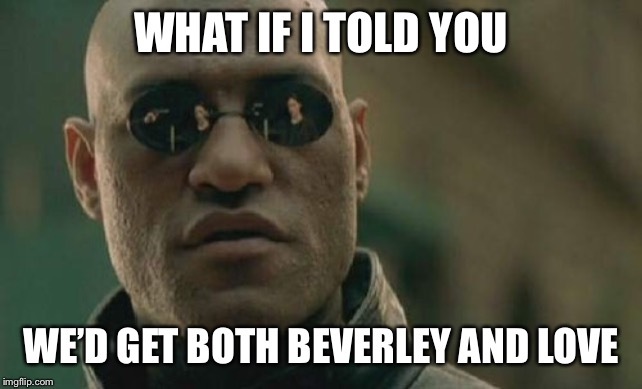 For the love of all that is churro, please let us get Beverly next year. Beverly and keeping Favors is certainly better than that K Love nonsense. LogGrad98, colton, Heathme and 1 other person like this. LogGrad98, UB, fishonjazz and 2 others like this. LogGrad98, Bawse Dawg, jazzVA and 1 other person like this. No, no Love. No thank you. He’s fragile, no defense, expensive... just no. LifeOnaPlate, LogGrad98 and fishonjazz like this. LifeOnaPlate and LogGrad98 like this. Last night's games told me anything is possible in the association. TOR lost, DEN lost, PHI lost all to 'inferior' opponents at home.